While border security is a hotly debated issue, the debate often ignores the effect illegals are having on those who live by the U.S.’s southern border. Sheriff Clarence Dupnik of Pima County, Arizona, (www.pimasheriff.org) provides “hands-on” insight to the border security chaos. At the moment pro-global warming groups think they’ve taken the field, but we’ll look at the future of the issue, what it means to the coming energy shortages and its probable demise as a political focus. Dennis Avery, co-author of “Unstoppable” (www.hudson.org) joins us. Finally, what would George Washington think of politicians’ treatment of the Constitution today? As big government expands, the understanding of what the founding fathers actually intended morphs as well. Retired Judge James Buckley authored “Gleanings from an Unplanned Life,” and is the only person to have served major positions in all three branches of government. 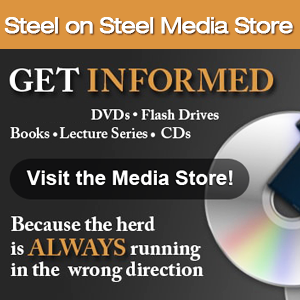 The last segment of Steel surveys his opinions of what is needed to put the country back on track. John’s boralogue highlights important news stories that have rolled down over the past few weeks.